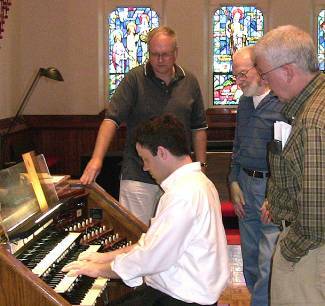 Nicholas Schmelter, Director of Music Ministries, demonstrates the sanctuary organ as (l-r) Terry Jankowski, Ken Holden and Ed Price watch carefully. Jim Wilkes at the console of Aeolian-Skinner Opus 1327 (1956), in unaltered original condition. The sanctuary provides a beautiful setting for the sanctuary organ. Trompette en Chamade at the rear of the sanctuary. 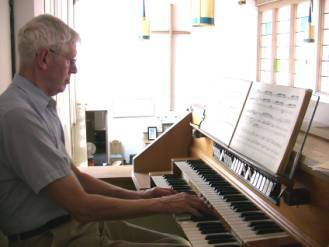 Ed Price at the sanctuary organ console. Beautiful windows form a pastoral backdrop for Nick Schmelter's explanations. 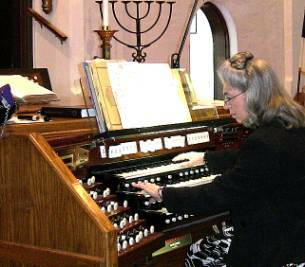 MaryAnn Balduf assays the colors available on the sanctuary organ. The May 2011 meeting of the Michigan Chapter of the Organ Historical Society called to order at 10 a.m. at the First Congregational Church, Saginaw, Michigan. OHS Michigan member Jon Best and Nicholas Schmelter, Director of Music Ministries, hosted the meeting. Present were Carl Balduf, chapter president, MaryAnn Balduf, Kenneth Holden, Terry Jankowski and Jim Wilkes. Guests included Jeanette Best, Bill and Marilyn Crane, Steven Egler, Tim Harris, David Holmgren, Blair and Catherine Konn, Jim McCulloch and Harold Nadler. Refreshments and an attractive audio-visual display about the sanctuary organ preceded the meeting. The minutes of the March 12, 2011 meeting were unanimously approved, with a treasury balance of $1837.15. The meeting was shortened because of the distances traveled by many members and guests. 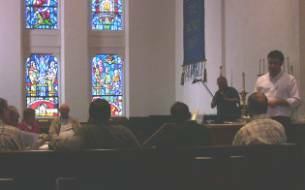 Following the meeting, Balduf thanked Nick Schmelter, Jon Best and the church membership for their hospitality. And the group proceeded to examine the two organs available in the church building. 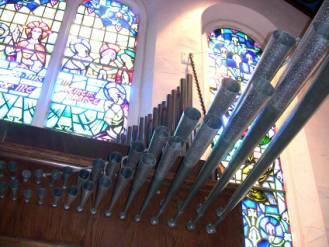 The following is a recap of the musical instruments available at the First Congregational Church of Saginaw. 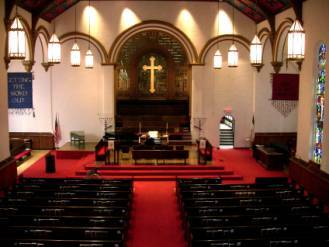 First Congregational Church is one of the finest facilities for music and musical outreach in the region. Its sanctuary boasts a three-manual, seventy rank organ, built by the Ernest M. Skinner Company of Boston (1930) and enlarged by John F. Shawhan (1965) and Scott Wheeler (1975). This instrument contains historic pipes from Skinner Op. 751 and other additions by Casavant Frères Ltée Op. 2809, and is in urgent need of restoration. 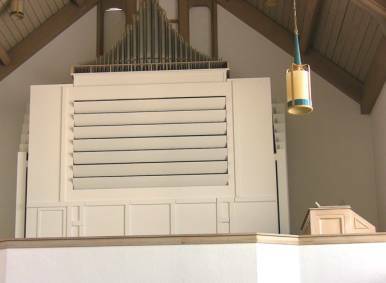 The chapel houses an unaltered two-manual, nine rank pipe organ, built by the Aeolian-Skinner Organ Company, Inc. (Opus 1327). Among other instruments First Congregational Church houses two Steinway pianos, two harpsichords, six octaves of handbells, and dozens of recorders, percussion instruments, and Orff instruments. Following the meeting, a goodly number of members and guests lunched pleasantly at The Panda House in Saginaw. For stop lists and demos, please check out the links below. 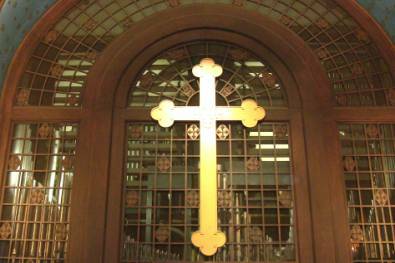 Aeolian-Skinner Opus 1237 resides in the balcony of the chapel. Click here for the Aeolian-Skinner Opus 1327 stop list and demonstration. Some of the sanctuary organ's 70 ranks can be seen when the swell shades are open above the chancel. 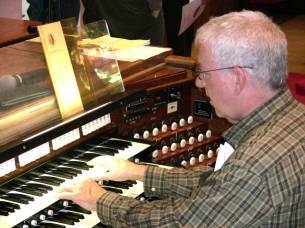 Click here for the sanctuary organ stop list and demonstration. Click here to read the Director of Music Ministries blog. 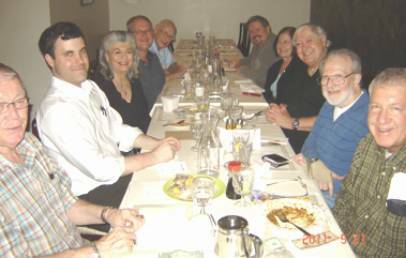 Harold Nadler, Nick Schmelter, MaryAnn Balduf, Terry Jankowski, Blair Konn, Jon Best, Jeanette Best, Carl Balduf, Ken Holden and Ed Price.